The ability to take a deep, clean and richly oxygenated breath that translates through healthy lung tissue into the oxygenated blood we need to sustain our lives is something we take for granted until that moment when we can’t. This is a dilemma faced by hundreds of thousands of humans, horses and other wee beasties everyday. Just as in human medicine, there are a myriad of supplements and medicinal options available for treatment of irritated, inflamed and damaged lung tissue and chronic lung diseases such as COPD, available for horses. Such treatment options can quickly rack up an expensive bill and their efficacy can be difficult to gauge. The analysis of the true benefits of many supplements is unproven, and where studies have been done on different types of treatment modalities there are gaping holes in this research and frankly more investigation needs to be done. In the meantime, if you own a horse that is suffering with a comprised respiratory system, you do not have time to sit about and wait and neither does your equine partner. What are you to do? Whether your horse is recovering from influenza or pneumonia, suffers from COPD, ROA or EIPH the use of a drug-free alternative therapy as an adjunct to an overall management strategy makes sense. Even if your horse appears to have relatively good lung function, the daily grind for a performance horse in dust and dirt can begin a nefarious process of minor inflammation that develops into a full blown respiratory issue over time. Our environment is a constant source of irritants and pollutants. Some causes of compromised respiratory health you may not have thought about include footing and hay. There is evidence that working horses on rubber footing can cause microscopic particles to enter and stay in their lungs (and in their rider’s lungs too). Random use of preservatives and drying agents in hay can also cause lung inflammation, especially in young tissue that is more prone to inflammation. Certain physiotherapy devices have been shown to aid in increasing the quality of life for animals that suffer with lung issues. For natural treatments the use of an acoustic airway clearance device can be beneficial. These small handheld devices are simple to use and well accepted by horses and the variety of other animals that can benefit from simple ten-minute treatments to improve lung health. These devices use audible sound and a mix of frequencies to break up mucous collected in the lungs. They also have a massage mode that acts as a natural bronchodilator, which promotes the opening of the airway passages. These functions clear lung passages and relax the long, smooth muscles of the airways that can become restricted. Just as you train your horse to the noise of clippers, you can easily train your horse to accept the noise of the small handheld acoustic and massage device. Look for devices that offer several different detachable applicators for the machine so you can use the device for multiple purposes. In the case of horses the primary applicator is the nose cup that has an open end that is simply placed over the horse’s nostril. The typical treatment session takes only about 10 minutes (once the horse has been acclimated over a longer session as a first introduction to the noise of the unit), making its use quick and easy as well as effective. The advantage of these devices, aside from being non-invasive and user and patient friendly is that they can be used to treat horses of all sizes: Foals; miniatures; donkeys. They can also be used to treat all sorts of animals: Cows; calves; goats; sheep; dogs; cats; or any other mammal with acute or chronic respiratory conditions. The VibraVM acoustic device is used to treat chronic obstructive pulmonary disease (COPD) in horses, which can be emphysema, chronic bronchitis, or even both. Recurrent airway obstruction (ROA), often referred to as asthma in horses, can also benefit from these treatments. ROA is an allergic respiratory disease with horses having chronic cough and nasal discharge, known as heaves and broken wind. For horses classified as bleeders, meaning they have exercised induced pulmonary hemorrhage (EIPH), the use of an acoustic device has been reported to help dislodge old blood collected in the lungs for maximum oxygenation. If you operate a holistic animal practice then you know that anytime you can find a therapy that has been used successfully for decades to treat a myriad of conditions in a myriad of animals in a drug-free and non-invasive manner, your clientele is going to be as happy as you are to put it to use. As an international level dressage competitor/clinician and coach myself I know how important it is to have my team of equine athletes in optimum health to meet the demands of top-level sport. Improvement in performance can give you an edge for your racehorse training success. It can boost the level of athleticism of your horse around a course or through a seven minute Grand Prix test by increasing the level of oxygenation to the working tissues. Wherever you land you know your equine athletes need all the help they can get when it comes to healthy lung function. When you provide alternative or veterinary treatments for animals in your practice the added value services can add up to boost both your bottom line as well as servicing a need in the equine community. 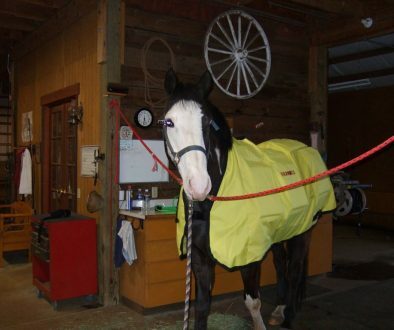 For large horse barn operators, that invest in heavy duty vacuums, fancy treadmills, hot walkers and swimming pools for their horses, the addition of an acoustic airway clearance device can be extremely beneficial to the well-being and increased overall health of their equine charges. 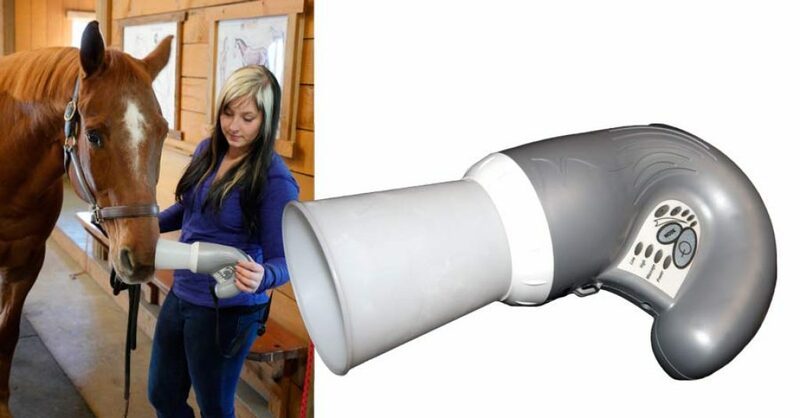 If you have a vet tech mentality and like the idea of providing a needed service and making a business from offering the service to those in need, these devices can also be used as a start up business idea to service barns in your area. In conclusion if your horse breathes easier so do you. Scope out the options available for treatment of lung issues and research their pros and cons. Compare actual prices for use over time for supplements and other treatment modalities, as well as doing your due diligence by investigating the all important, expected results.